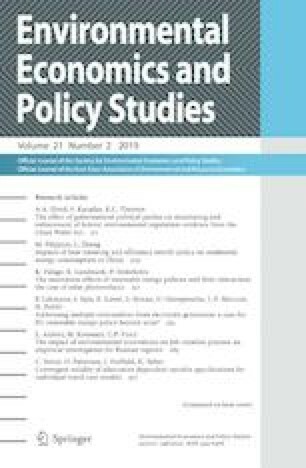 The aim of this paper is to explore the impact of environmental innovation on employment in 85 Russian regions (federal subjects) for the period 2010–2014. In particular, we use latitude and longitude coordinates to compute the distance between Russian regions according to haversine formula. In this way, we measure the spillovers as the weighted sum of R&D capital stock on the basis of computed distance. The contribution to the literature is to explore whether environmental innovations are labour-friendly or labour-saving in Russia. From the empirical results of least squares dummy variable corrected (LSDVC) estimator, we observe different results by Federal Districts (groupings of the federal subjects) of the Russian Federation. The finding is very important in terms of policy implications for supporting employment. The research leading to these results has received funding from the Ministry of Science and Higher Education of the Russian Federation in 2017–2108 (project ID: RFMEFI57217X0005). The authors are grateful to Denis Martynov from HSE (https://www.hse.ru/en/org/persons/39054877#sci) for a help in map visualisation of data. Oblasts (Oblast is transliteration of the Russian word “oблacть”. 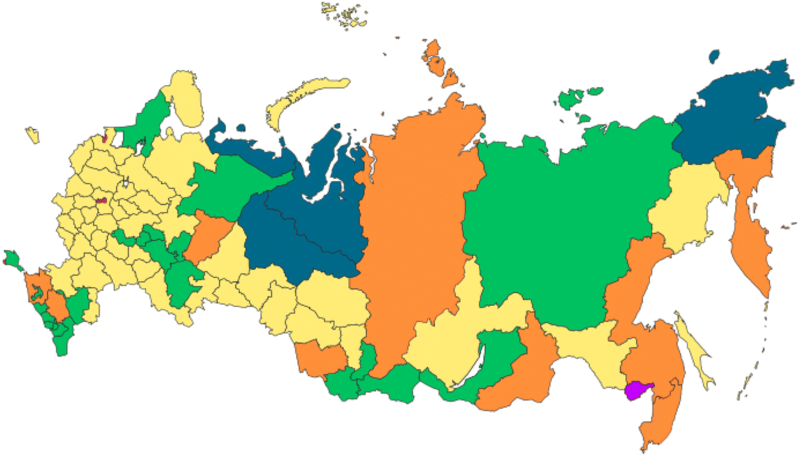 Sometimes federal subjects of “oblast” type are called as “regions” in English) are the most common type of federal subjects in the Russian Federation. Each oblast has locally elected legislature and a governor. In most cases, oblasts are named after their administrative centers (AdmCent further). Republics in the Russian Federation are nominally autonomous. Each republic in the RF has its own legislature and constitution. In international affairs, republics are represented by the federal government of the Russian Federation. In many cases, republics are formed on the historical areas of living of some specific ethnic minorities within the ethnic structure of the RF population. Krais, (Krai—is the transliteration of Russian word “кpaй”) in terms of legislation, are essentially the same as oblasts. But the word “krai” in Russian language means “border”, “frontier”. In most cases, krais are located on the borders of the RF (i.e., they are frontier regions). Autonomous okrugs (Okrug is transliteration of the Russian word “oкpyг”. “Okrugs” are in general called as “districts” in English language) are regions with substantial or predominant ethnic minority. Federal cities are the major cities of the Russia that are separate federal subjects of the RF. 46 oblasts [named mainly by their Administrative centres (AdmCent)]: Amur (AdmCent is Blagoveshchensk); Arkhangelsk; Astrakhan; Belgorod; Bryansk; Chelyabinsk; Irkutsk; Ivanovo; Kaliningrad; Kaluga; Kemerovo; Kirov; Kostroma; Kurgan; Kursk; Leningrad (AdmCent is Saint Petersburg); Lipetsk; Magadan; Moscow; Murmansk; Nizhny Novgorod; Novgorod; Novosibirsk; Omsk; Orenburg; Oryol; Penza; Pskov; Rostov (AdmCent is Rostov-on-Don); Ryazan; Sakhalin (AdmCent is Yuzhno–Sakhalinsk); Samara; Saratov; Smolensk; Sverdlovsk; Tambov; Tomsk; Tver; Tula; Tyumen; Ulyanovsk; Vladimir; Volgograd; Vologda; Voronezh; Yaroslavl. 22 republics: Adygea; Republic of Altai; Bashkortostan; Buryatia; Chechnya; Chuvashia; Crimea; Dagestan; Ingushetia; Kabardino–Balkaria; Kalmykia; Karachay–Cherkessia; Karelia; Khakassia; Komi; Mari El; Mordovia; North Ossetia-Alania; Sakha (Yakutia); Tatarstan; Tuva; Udmurtia. 9 krais: Altai Krai; Kamchatka; Khabarovsk; Krasnodar; Krasnoyarsk; Perm; Primorsky; Stavropol; Zabaykalsky. 4 autonomous okrugs: Chukotka; Khanty–Mansi; Nenets; Yamalo–Nenets. 3 federal cities: Moscow; Saint Petersburg Sevastopol. 1 autonomous oblast is the Jewish Autonomous Oblast.